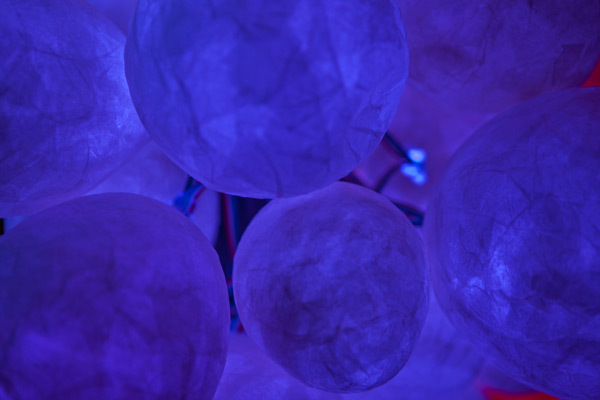 Phenomenology (Full Spectrum Healing) is an experiential installation of 700 balls of light, emitting electromagnetic radiation at specific wavelengths within the visible spectrum. The work explores ideas of chromatherapy and the effect of specific vibrations of energy on the human body. It connects these ideas with ancient eastern philosophies linking these wavelengths to seven energy centres within the human body. This project explores a meeting place between quantitative research and unquantifiable human experience. 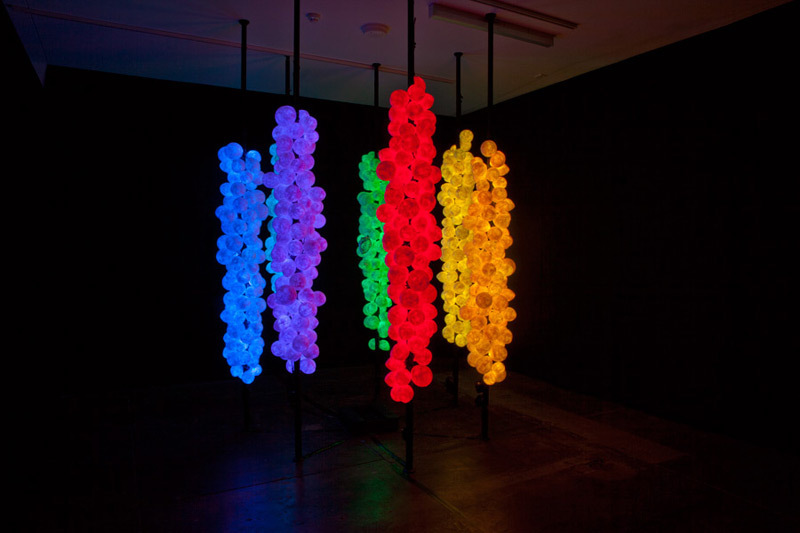 The installation is made up of 700 RGB LEDs positioned inside handmade papier mâché lamps. 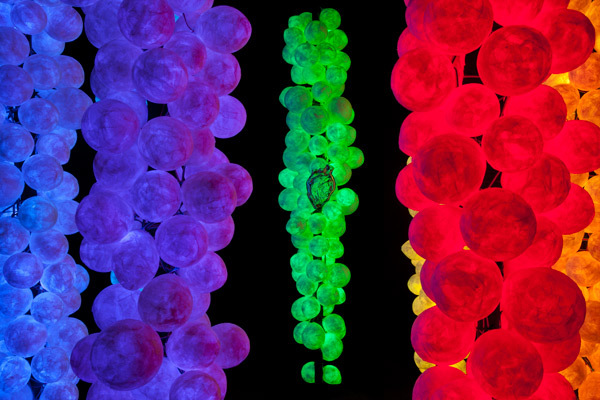 These balls of light are connected to arduino micro-controllers, programmed to oscillate between key wavelengths in each colour range. 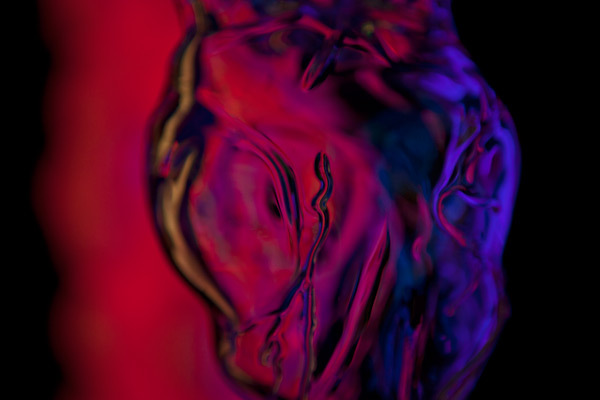 Within the installation exists an anatomical glass heart, which forms a symbolic representation of the central energy centre, and provides the audience with a link to the conceptual framework of the project. This work becomes fully realised when experienced by its audience, as each individual becomes part of the work through their personal engagement with it. The artist invites the audience to be part of a phenomenological encounter. This project was researched and produced in Berlin Germany and Sydney Australia between August 2012 and September 2013. Special thanks to Lorianna Atmen Paradise (Berlin), Laurence Castagnoli (Berlin/Sydney), Nicholas Clarke (Sydney), Nathan Colcott (Sydney), Alexander Cunningham (Sydney), Christopher de Vries, Catherine Dyhin (Sydney), Bernd Hartmann (Berlin), Samantha McCourtie (Sydney), Adrian Mcgahen (Sydney), Emmet O'Sullivan (Sydney), Tom Phillipson (Berlin), Sylwia Skoczylas (Sydney), Amy Sweetapple (Sydney), Ioulia Terizis (Sydney), Denizen Glass Design (Sydney), Peter Kuchinke (Berlin/Hjørring) & Baruther Glashütte (Germany).